eTrust EZ Antivirus , detects and removes 100% of computer viruses "in the wild"* - keeping you safe from virtually all known virus threats. Plus, with automatic software updates, new threats that emerge daily won't stand a chance. "Delivers speedy and reliable virus protection... it's the fastest antivirus program we've tested"
NEW Improved User Interface- New menus, buttons, and icons make protecting your PCs quick and easy. NEW File Quarantine - Allows users to isolate and review detected viruses, enabling further research into specific threats. 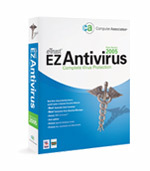 NEW Advanced Help System - Redesigned to make your eTrust™ EZ Antivirus experience seamless. Real-time Scanning - Proactive protection stops viruses from entering your computer in real time. Fully-Automatic Updates - Effectively addresses the #1 reason PC users suffer virus attacks: out-of-date signature files. Automatic E-mail Scanning - Provides protection against viruses that arrive via e-mail ¨C before they can be executed. Interactive Virus Detection Messages - Gives you an easy way to research detected viruses via a direct link to CA Virus Information Center. Low Overhead - Uses fewer system resources and provides better compatibility, quicker scans, and faster update downloads. Heuristic Scanning - Detects new threats even before virus protection updates are created. BitDefender 9 Standard - The antivirus software solution for your personal computer!